So what’s with all the wild cows on Lantau island? Who do they belong to? And how did they end up just moseying around Mui Wo as if they own the place? The wild herd of cows that inhabit Mui Wo village, or at least the herb that I see regulatory, seem to number about 20, with two large bulls, a harem of females, and a number of little ones. 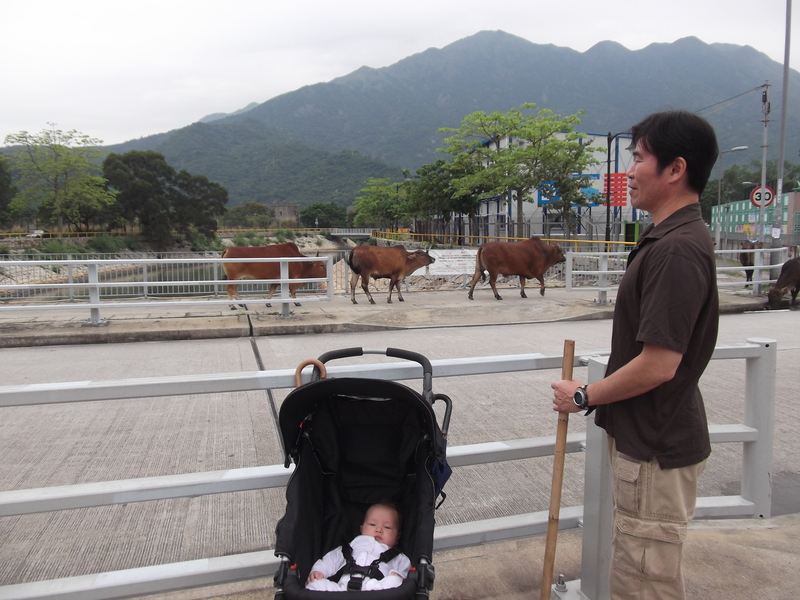 No one seems to take them on — the sign by the ferry simply says ‘Enjoy the presence of Lantau’s feral cattle! Do not touch them, and do not try to feed them. Stay calm and quiet.’ That’s what people seem to do around here. The cows just go up and down through the town, people ride past on their bikes, and apparently it is fine. I’ve heard that they are the descendants of the cows that were once milked at the Trappist Dairy, a small dairy farm run by monks in the early 60s but now defunct. When the dairy closed down, the cows were released into the hills. This is why there are herds of cows all over Mui Wo, Pui O, and further on Lantau. The wild water buffalo, on the other hand, I have no clue about. Scary beasts, if you ask me. Humungaloid horns that I would not want to get too close to. Roaming around in the other nearby towns, thankfully the buffalo don’t come to Mui Wo. Apparently not too long ago one of them gored someone to death. You can read more about it by clicking on the picture below from the wonderful blog Mui Wo and Me, if you are really determined. Me, I won’t be messing with the cows. Or the buffaloes, for that matter. I’ll just leave well enough alone, and walk with my bamboo pole.